Thomas Keller. 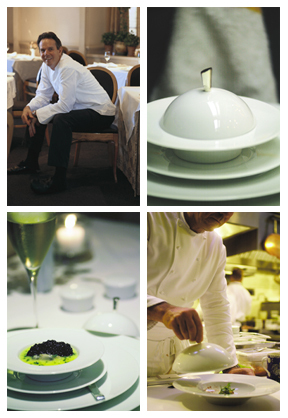 Among all the celebrity chefs, he is known as the ultimate perfectionist: The best ingredients. Flawless technique. Perfect finish. 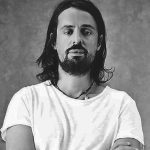 This is probably why he has won numerous James Beard awards and is the only American chef with two top-rated Michelin 3-star restaurants: The French Laundry in Napa Valley, which revolutionized fine dining, and Per Se in New York, which took it to a new level. The secret of his success, though, is not just great cooking. Keller also knows how to make his culinary creations look like art. 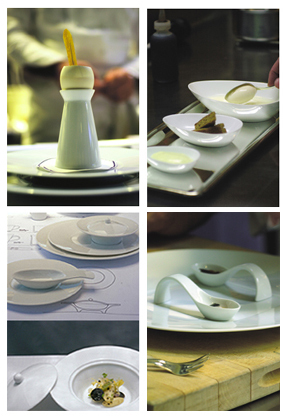 He’s such an expert on presenting food, he even designed his own Limoges porcelain dinnerware. 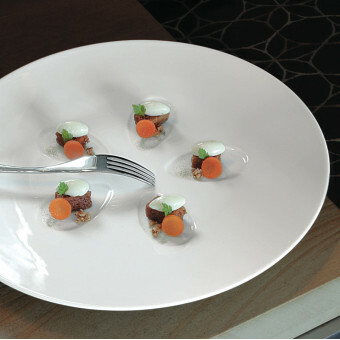 Note how this Oval Plate with Flowers allows you to deconstruct a dish and highlight each component. 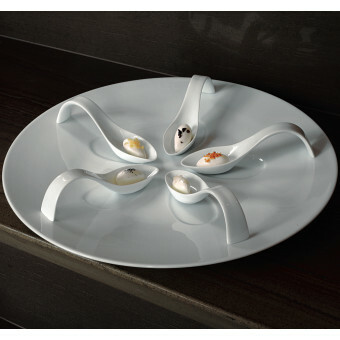 Even if it’s the same item, by breaking it up into smaller pieces and arranging them separately, you can highlight your food, like on this Buffet plate with a flower center. Every course you serve should be properly framed, just like fine art. 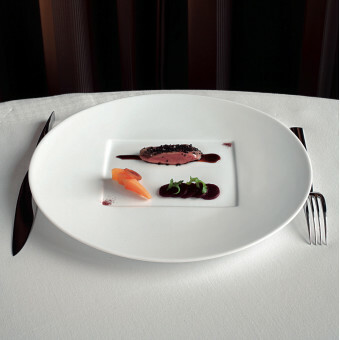 And just like art, the plates that frame your food could either complement it or contrast it for greater focus. 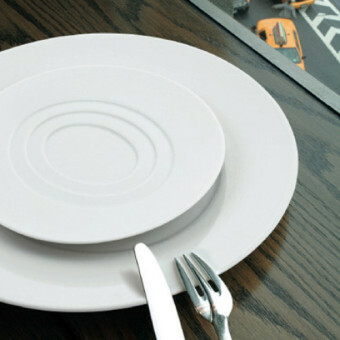 This round charger with an oval center creates a frame that complements the shape of the food being served. This round charger with a square center gives a strong definition for a course of multiple items. 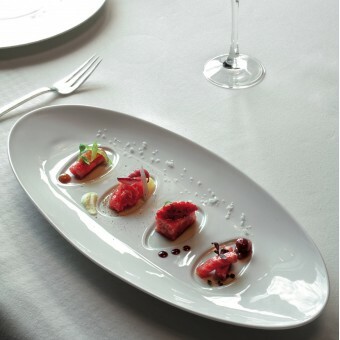 To create a sense of drama, use special dishes that draw the eye to the food being served. 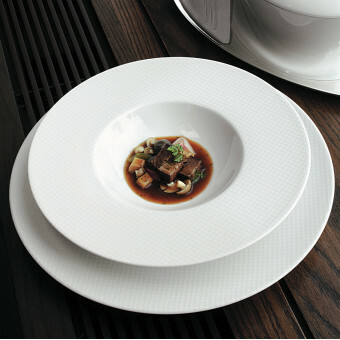 The extra deep well of this Rim Soup Bowl creates a focal point that draws your eye in. 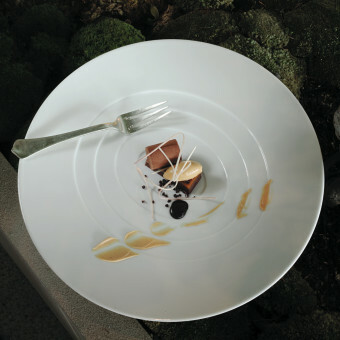 Similarly, the concentric ovals of this dessert plate with concentric ovals draws your eye to the dessert. Some foods already have strong shapes — a square or oval slice of cake, a round souffle, or an oval quenelle dumpling. In those cases, naturally follow the shape of the food you’re serving. Again, notice how the shape of the dessert is reflected in the concentric ovals of the dessert plate. Some foods, like risotto, do not naturally have any form or shape. 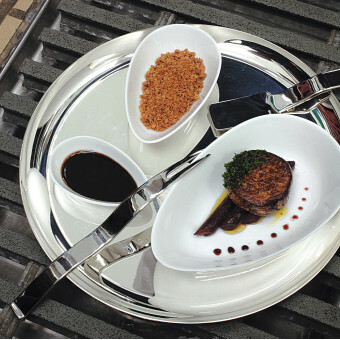 For dishes like that, Keller designed a complementary Checks pattern dinnerware with a subtle checked pattern. This adds contrasts and interest to the course, without overwhelming it with strong colors or patterns. 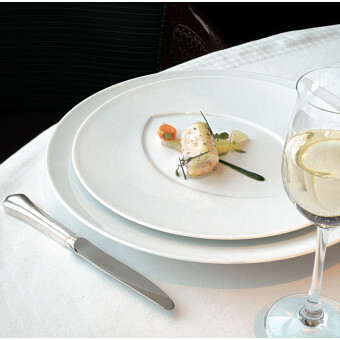 Checks dinnerware has a subtle pattern that gives contrast to light colored dishes. A round dinner plate with almond center uniquely highlights the dish. This oversized spoon makes a surprise out of these appetizers. Set items one after the other, in a regular space and with similar pieces or sizes, to create a sense of rhythm as the person experiences each part of the meal. 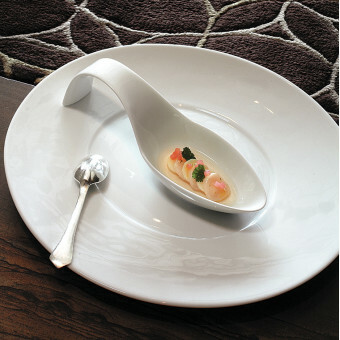 Small sized spoons can be used to create a sense of rhythm and make even sauces or dressings look like art. 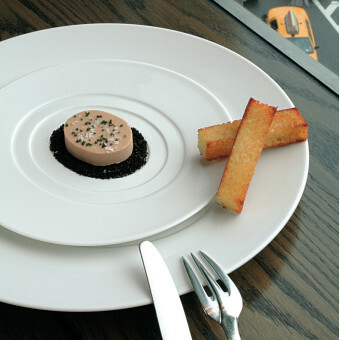 These quenelle dishes create a sense of rhythm, going from small to medium to large. Every museum or gallery exhibit has a deliberately chosen wall color to tie it all together. When there are many different color or patterns, white is usually the unifying color. This is exactly what Thomas Keller has done so well. 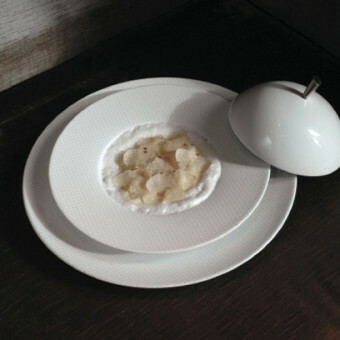 His pure white Limoges porcelain dishes bring together an entire meal, from dark colored soups to brightly colored meats and vegetables to ivory and cream risottos and desserts. They are all celebrated like works of art. …just like a Master Chef!